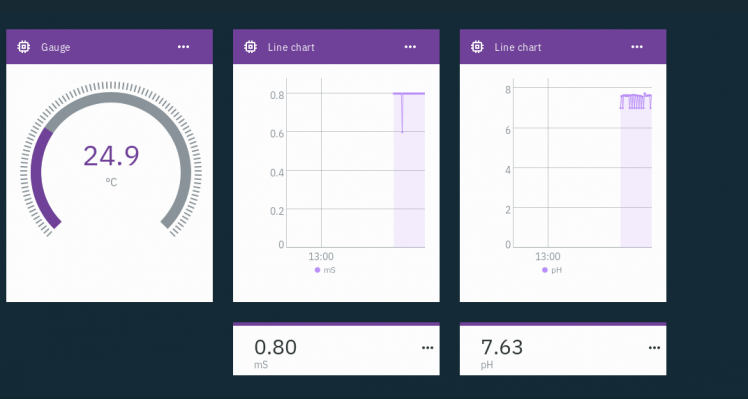 This will show how to monitor EC, pH, and temperature of a hydroponics setup and upload the data to IBM's Watson service. Watson is free to get started with. There are paid plans, but the free plan is more than enough for this project. An EC_Salinity Probe Interface board and a K1 conductivity probe. You can get them both at ufire.co. An ISE Probe Interface board and a pH probe also from ufire.co. You can save 10% by joining the GroupGets campaign. Search for and install 'EC_Salinity'. The uFire devices that we will be measuring EC, pH and temperature connect to the ESP32 by the I2C bus. 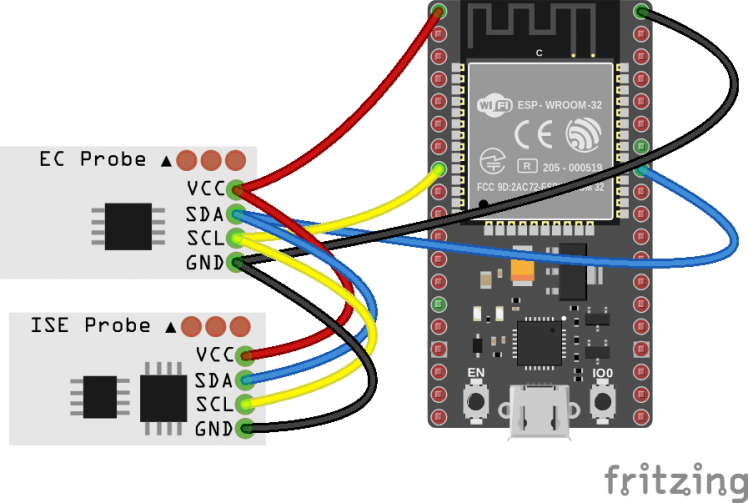 With the ESP32, you can choose any two pins for I2C. Both devices will be on the same bus, so the SCL and SDA pins will be the same. If you look at the code (next step), you will see these two lines. I decided to use pin 19 for SDA and pin 23 for SCL. So Connect the ESP32's 3.3v (or whatever the pin may be called on your particular board) to the EC uFire device's 3.3/5v pin, GND to GND, 19 to SDA, and 23 to SCL. Now connect the uFire pH board to the EC board, pin for pin. The pinout on your ESP32 may be different from the picture. 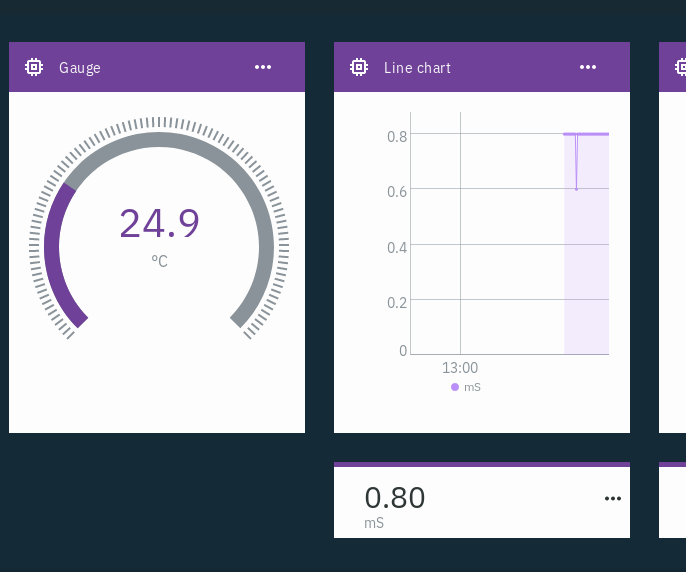 Go to the IBM Watson IoT Platform website and click 'SIGN IN' in the upper right corner. Click the link near the bottom to 'Create and IBMid'. Complete the registration process and you'll eventually find yourself on a mostly empty looking webpage. In the upper right corner, you'll see your email address, click it and you will see that it says you aren't a member of an organization. Click 'Sign up'. You will find yourself at the IBM Cloud Login page. Click 'Login', and then on the next page, click 'SIGN UP'. Complete the form and then check your email. Head back to this page and install the 'Internet of Things Platform'. 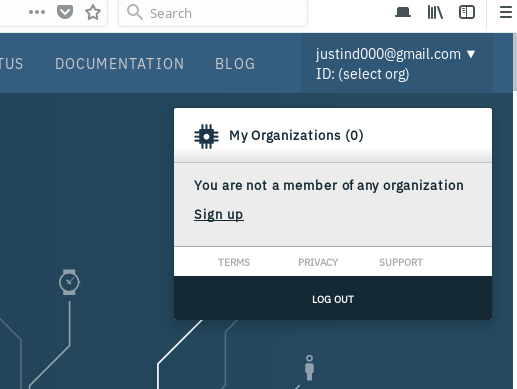 Now head to the very first page, here, click your email address, and you should see an organization in the menu called 'Bluemix Free xxxxxx'. Take note of the six digit number/letter combination. You'll need it for later, it is your organization ID. Now you can go to this link, click 'Internet of Things Platform-vr. On the next page, you'll see a 'Launch' button. I would copy that link for quicker access next time, it will be where everything is done from here on. You'll see a menu on the left side of the screen. Click the one that looks like a microprocessor labeled 'Devices'. In the upper middle of the screen, you'll see 'Browse', 'Action', and 'Device Types'. Select 'Device Types', and then '+ Add Device Type'. On the 'Register Devices' screen, you should see your device type, ESP32, already filled in and a black to enter a 'Device ID'. I'll call mine '0001'. Click 'Next'. Leave the authentication token blank and click 'Next' and then 'Done'. On the following screen, you will be given your one and only chance to copy the 'Authentication Token'. Copy it and also take note of the 'Organization ID', 'Device ID' and 'Device Type'. You'll need it for the next step. Keep that page open and go to the next step. Change Organization_ID, Device_Type, Device_ID, and Authentication_Token to the information you got from the previous step. Upload it to your ESP32 and take a look at your new device on the IBM Watson site. Click the device and then 'State'. It should be showing you updating values. If it isn't working, you may find some useful information under 'Logs'. On the IBM Watson IoT Platform page, click the very top left icon, the one with nine small dots labeled 'Boards'. Click '+ Create New Board', call it whatever you want, click 'Next' and then 'Done'. Open the newly created Board, then click '+ Add New Card'. I'll make a temperature visualization using the Gauge chart type. Click 'Connect new data set' on the next page. In the 'Event' box, select 'status', then in the 'Property', you should see a listing of our data items, choose 'C'. Change the 'Type' to number and the 'Unit' to 'C', then 'Min' and 'Max' to 0 and 85. Click 'Next'. Change the size to 'S' or 'M' to actually see the gauge chart. 'Next' and then 'Submit'. Repeat the above steps for the other data items.